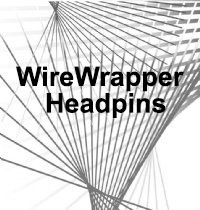 Our 3" Wire Wrapper Headpins are totally AWESOME!!! Choose 3" Wire Wrappers for tight, beautiful and remarkable wraps. Note: They are a little more expensive…but, definitely worth it. Wire wrapping really can be a pleasurable experience! maker's guide to straight up wire wrapping.